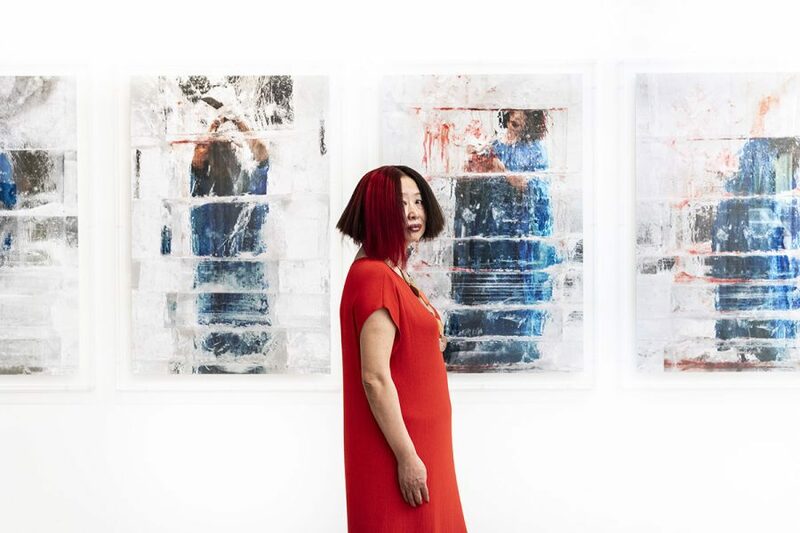 Xiao Lu, 2019, pictured in front of her work ​Polar《极地》​(detail), 2016, C-type prints, 80 x 120 cm, editions 1/9 and 5/9, printed 2018 documentation of performance: 23 October 2016, Beijing Live 1, Danish Cultural Center, 798 Arts District, Beijing, China. Photographs by Yi Zhilei. Courtesy the artist. 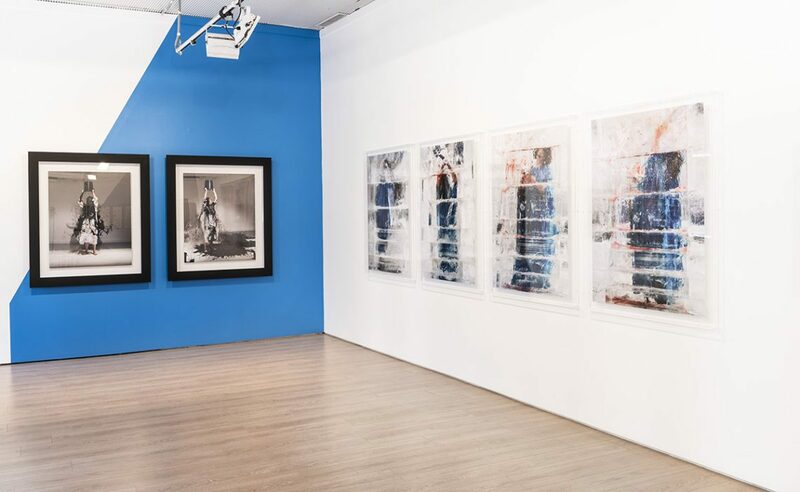 Installation view at 4A Centre for Contemporary Asian Art, photograph: Kai Wasikowski. 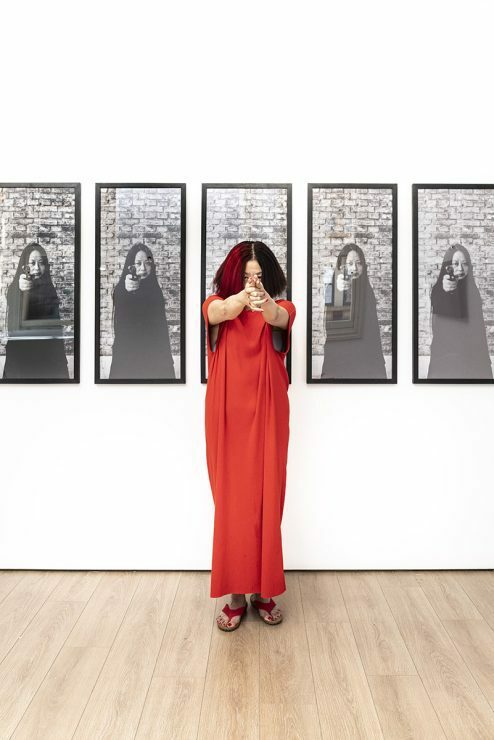 Xiao Lu, 2019, pictured in front of her work ​15 Gunshots… From 1989 to 2003《15枪…从 1989到 2003》 , ​2003, 15 black and white digital prints, framed and then punctured by a bullet. 100 x 45 x 15 cm, printed in 2018, edition 12/15. Photographs by Li Songsong. Courtesy of the artist. Installation view at 4A Centre for Contemporary Asian Art, photograph: Kai Wasikowski. Left: Xiao Lu, ​One《合一》​, 2015, single channel video, 3.10 minutes, documentation of performance: 5 September 2015, Live Action 10, Valand Academy, University of Gothenburg, Sweden. Filmed by Zhang Zhiqiang, edited by Xiao Lu. Courtesy the artist. Right: Xiao Lu, ​Polar《极地》​(detail), 2016, C-type prints, 80 x 120 cm, editions 1/9 and 5/9, printed 2018 documentation of performance: 23 October 2016, Beijing Live 1, Danish Cultural Center, 798 Arts District, Beijing, China. Photographs by Yi Zhilei. Courtesy the artist. Installation view at 4A Centre for Contemporary Asian Art, photograph: Kai Wasikowski. Thirty years ago in Beijing, on the eve of Chinese New Year, contemporary Chinese artist Xiao Lu made her artistic debut by firing a shotgun at her installation Dialogue. Ever since, these famous shots have reverberated on multiple political levels, often noted as an important feminist moment in contemporary Chinese art, and as the first shots of Tiananmen Square (which occurred four months later). The mythology of this moment and Lu’s three-decade-long career are being thoughtfully considered in Lu’s first major retrospective Impossible Dialogue at 4A Centre for Contemporary Asian Art. A portion of the exhibition centres on Dialogue, 1989, which was initially shown as part of the landmark show China/Avant-Garde. 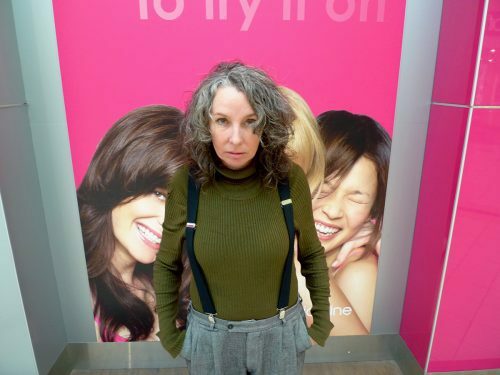 After Lu undertook her extreme performance, the exhibition was shut down and the artist was forced into hiding, living in Sydney for an extended period. Meanwhile Lu’s co-conspirator and boyfriend at the time, Tang Song, was arrested. While he had little involvement with the work, it was his political reading of Dialogue that became the dominant narrative. Yet over the decades Lu has resisted such overt political readings of Dialogue. Xiao Lu, ​15 Gunshots… From 1989 to 2003《15枪…从1989到 2003》 , ​2003, 15 black and white digital prints, framed and then punctured by a bullet. 100 x 45 x 15 cm, printed in 2018, edition 12/15. Photographs by Li Songsong. Courtesy of the artist. 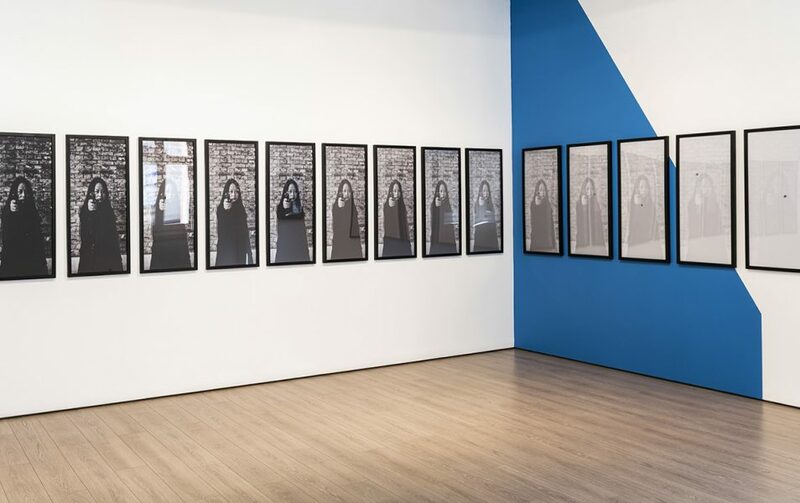 Installation view at 4A Centre for Contemporary Asian Art, photograph: Kai Wasikowski. In showing a more complex and nuanced reading of Lu’s artistic history, 4A is exhibiting photographs, early ephemera and archival material from the performance at China/Avant-Garde, alongside a series of various performance documentations and videos, particularly from the last 15 years. As Tai explains, the works in Impossible Dialogue all largely stem from 2003 onwards, which was “the moment when Lu decided she wanted to claim her place in history and re-articulate her intent behind her work.” The show also includes documentation from a newly commissioned performance piece, which Lu undertook with almost scientific precision by setting up a hypothesis she wanted to test. It’s a process she uses for much of her work, particularly as the outcomes can never be known in advance. “It’s why I think her performances are so powerful, because there’s always an aura of precariousness,” says Tai. 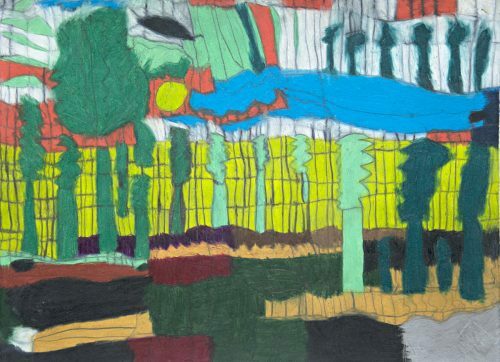 Blindside’s Summer Studio residency allows artists to develop their work over a three-week period during the art world’s quieter time, culminating in an exhibition in mid-January. 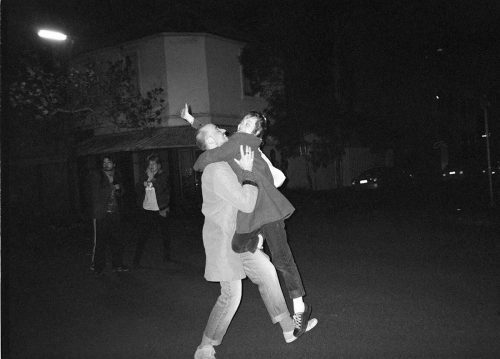 Tai Snaith takes a look at two pairs of artists who have formed intergenerational, informal mentorships, both sharing the love of humour.